The last time I came to Oklahoma I brought several projects to work on. That was a little silly because I had the whole cleaning out my parents house and grand baby being born thing going on. So I left a couple of undone projects in my sister's garage. One of them was this vintage children's table and chairs. Wow! These are the exact same chairs!!!! But then I realized that my ceilings aren't high enough to pull off this look. And then I found out about the whole grand baby thing. And well, of course, the chairs and table had to be for him. But then I found out that the theme for this month's FAB FURNITURE FLIPPING CONTEST was "Spray It Pretty" and since I was going to be in Oklahoma during the time I would be preparing my contest entry, I knew this was the month that the table and chairs would re-enter the world of the lovely. I was especially excited because HomeRight was the sponsor for this month's contest. (you might remember I love HomeRight products. 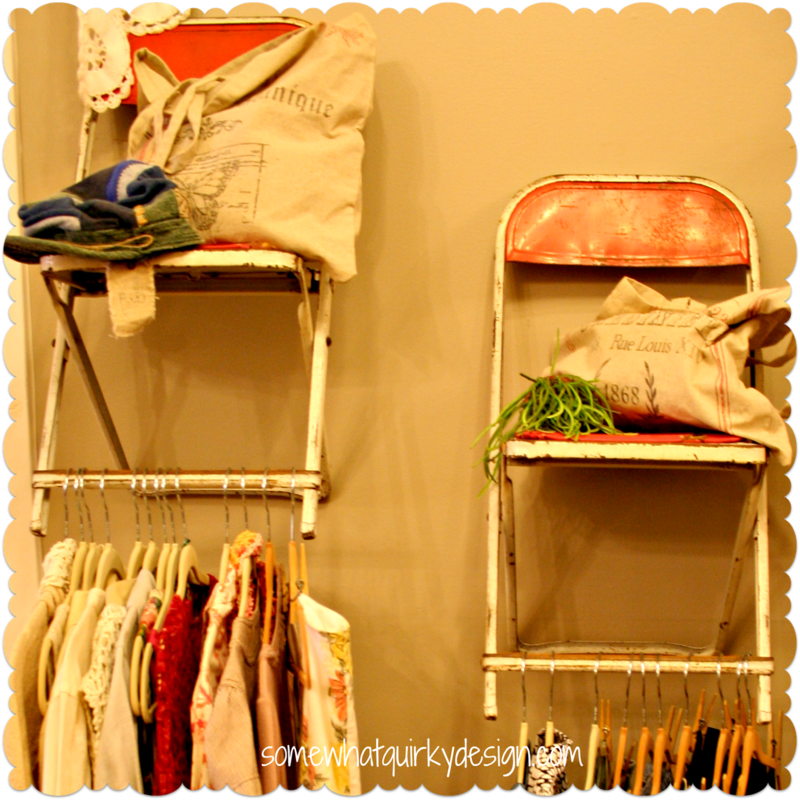 They revolutionized my kitchen and bathroom cleaning here, my spring cleaning here, and my basket painting here.) They would be supplying each of the participants with one of their HomeRight Finish Max Fine Finish Sprayers to use for our projects! I waited anxiously for the sprayer to arrive but alas it did not arrive until the day AFTER I flew to Oklahoma! The good news is that I have a Finish Max waiting for me when I get home on Halloween. The bad news is I didn't get to use it for my project and I had to go buy spray paint! The other good news is that as soon as I get home I'm going to use my Finish Max to paint something and I'm going to tell you how wonderful it was not to have to get out the paint brush. So let's get to the project. 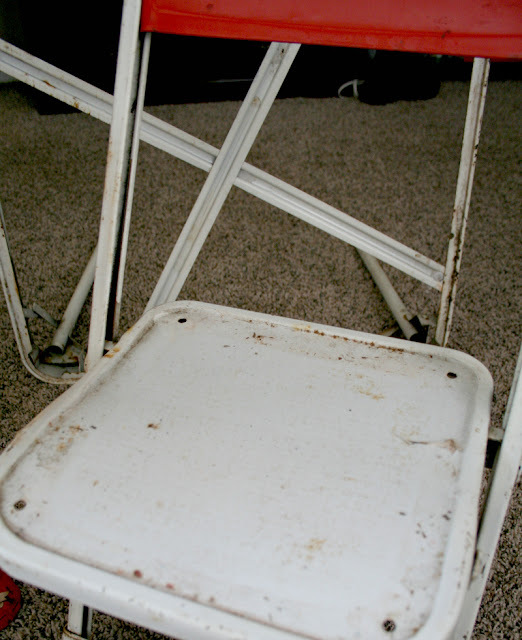 The first thing I had to do was to remove the vinyl covered top and seats so they could be recovered. 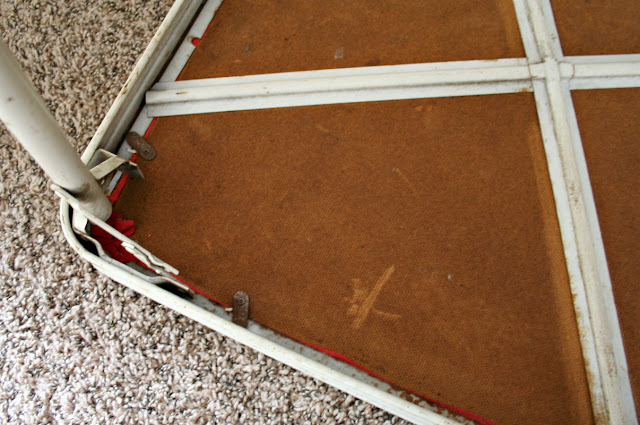 I would have liked to just replace the seat pads and the top, but they both had intact hardware on them that attached them to the frames and I did not know if I could find an equivalent replacement so I just worked with what I had. Then came a MASSIVE clean up. Then I sanded off the rust. About that time I was really wishing that I was just using them for clothing racks! Then the easy part was spraying the primer and the paint. In-between coats of paint I worked on covering the top of the table and the seat pads with some laminated fabric that I purchased at the Country Living Fair in Columbus, Ohio back in September. 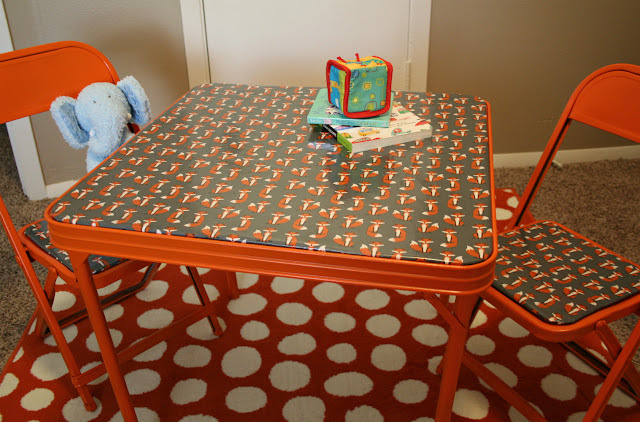 Could I just say that now that table with chairs is just darling? Isn't that about the cutest thing you've ever seen? Well, maybe the second cutest thing . . . 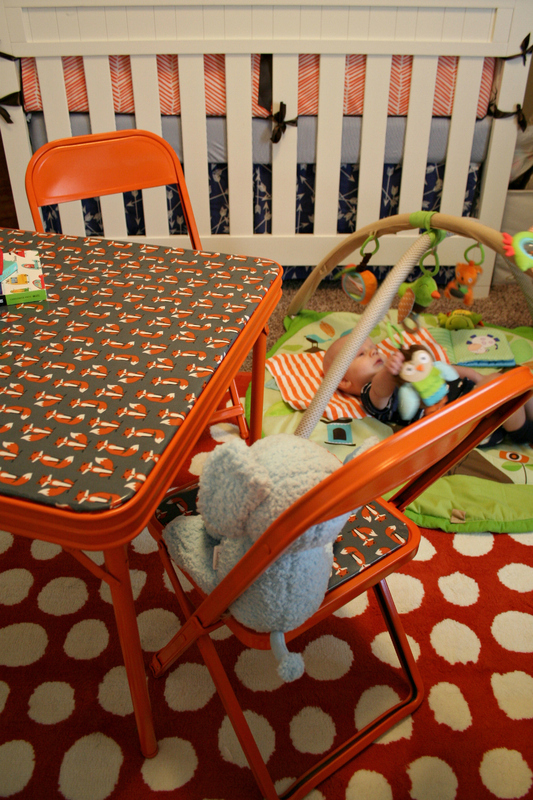 Although play pads are more his speed right now, it won't be long until this table gets used on a regular basis. I want to thank HomeRight for sponsoring the October Fab Furniture Flipping Contest! As well as this months host's for the party Lynn @ On Fern Avenue and Evy @ Evy's Creations. 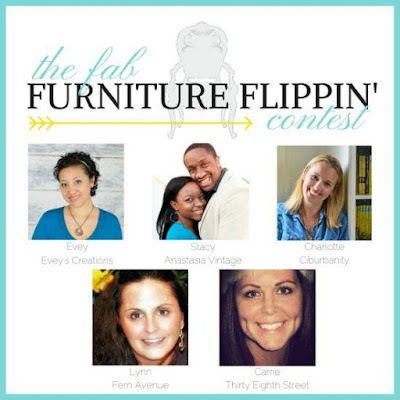 If you are interested in participating in the Fab Furniture Flipping Contest in the future, just send an email to info@fabfurnitureflippincontest.com. I will post again this week about the products I ended up completing this project with and why I PREFER PAINTING WITH A SRAYER TO PAINTING WITH SPRAY PAINT. IT IS NOT THE SAME!!! AND YES I AM YELLING!!! So see you soon and don't forget to stop by the host's pages to see the other projects that were linked up for this months contest. Oh yea, and you can vote for your favorite! Especially if your favorite is MINE!!!! 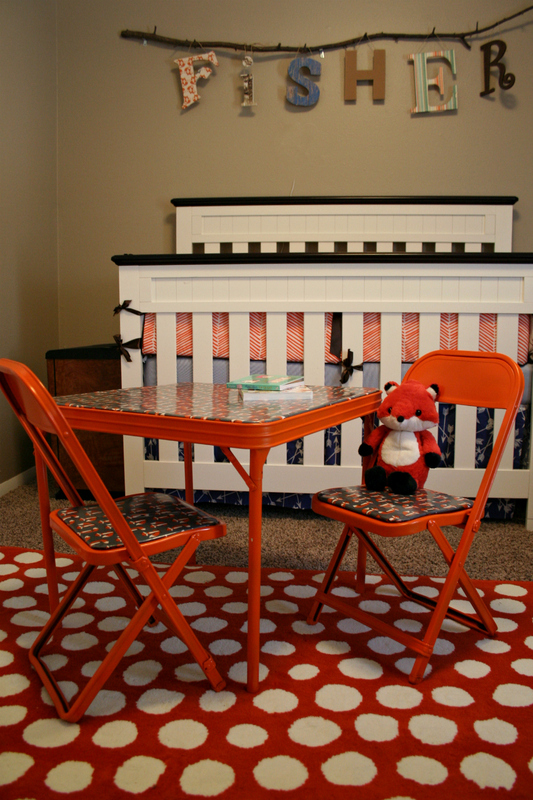 Oh what a sweet and busy little one 'sitting' at your revived and beautiful and cute table and chairs. A very happy post today even though the spraying was annoying. 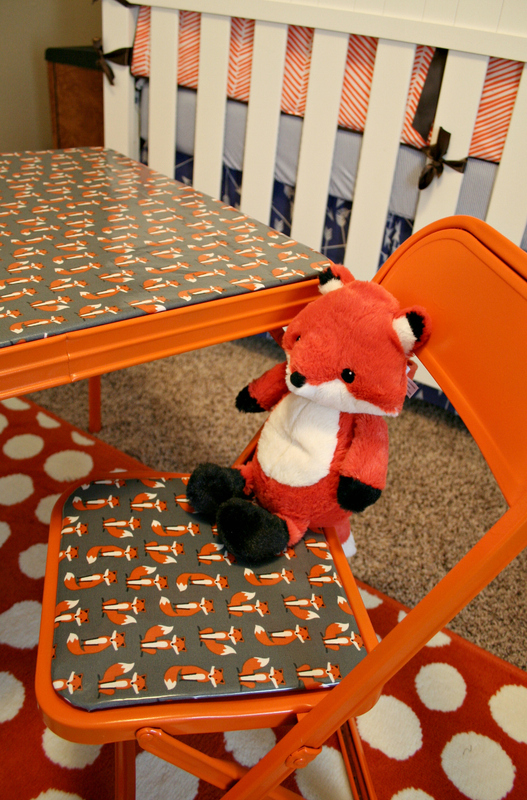 The little foxes are just right for that bright orange table and chairs. You have the sweetest little grandson. That is so cute, Karen! I love the foxes! That sweet baby isn't bad, either. ;) What a cutie. Everything about this post is adorable, just maybe one thing is a bit more adorable. Will pin when I get back from vacation. The re love of the table and chairs is adorable along with your grandbaby. What a sweetie. Glad you got to enjoy a project along with your visit. 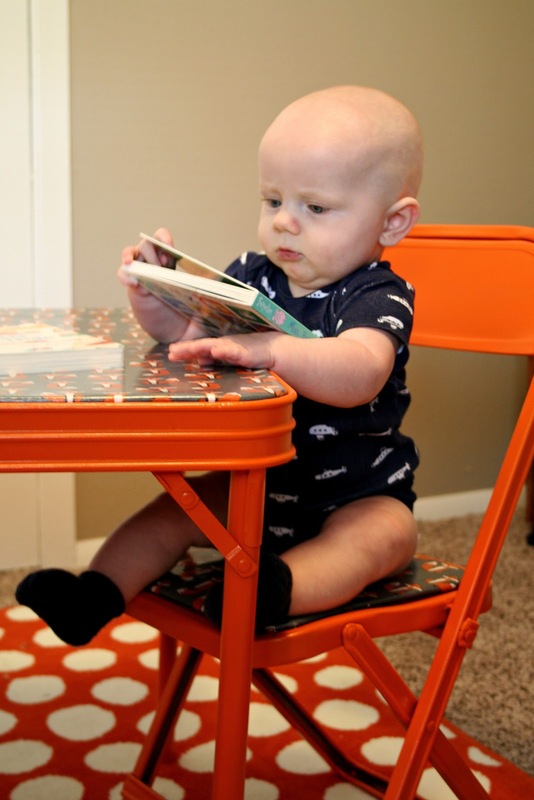 OH my goodness, that table and chairs is ALMOST as cute as that grandson! ;) I LOVE the foxes and the color. Kinda surprised you didn't go with black and white, though... ;) Congrats Grandma! Did you want to make me cry today! 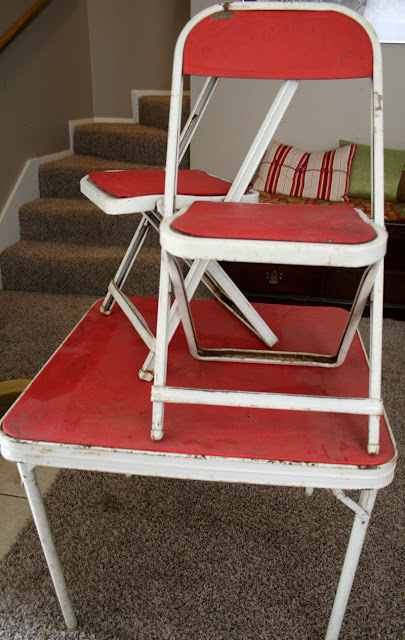 That looks exactly like the table and chairs my sister and I played at for years. Now I really wonder where my hoarder parents put the set. This table and chairs are so adorable - perfect for an adorable little grandson!! Have fun using your sprayer, it's awesome! Oh wow, that turned out just amazing! And I must say your Grandson is just the cutest thing ever!! 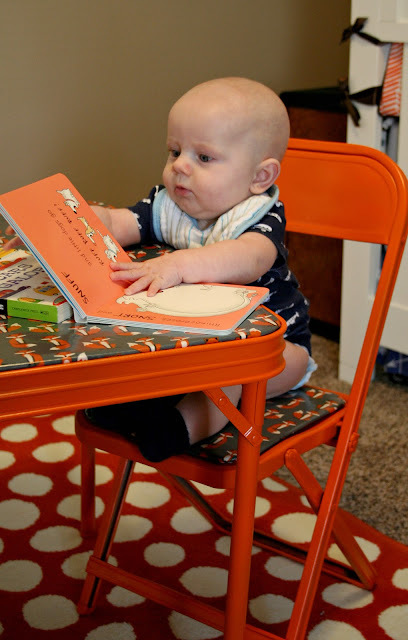 How stinkin' cute is that baby and his furniture??? I just about missed this post, so glad Christine featured it. You did an awesome job on this, Karen!